The 48th Highlanders of Canada is a Canadian Forces Primary Reserve (i.e., part-time militia) infantry regiment based in Toronto, parading out of Moss Park Armoury. The regiment is part of 4th Canadian Division's 32 Canadian Brigade Group. Ever since its formation in 1891, the 48th Highlanders have had a longstanding tradition of participation in the life of its parent city, Toronto. The regiment has participated in community functions for over 100 years, in addition to fulfilling its operational duties around the world. Since its inception, the men and women of the regiment have been among the first Canadians to step forward and answer their nation's call. Members of the regiment have served on Operation RECUPERATION, in the Golan Heights, Korea, South Africa, Cambodia, Cyprus, Bosnia, and Afghanistan to name only a few and of course, both World Wars and the Boer War. The regiment is allied with the British Army's Royal Regiment of Scotland - formerly the Highlanders (Seaforth, Gordons and Camerons) (formerly the Gordon Highlanders). The relationship with the Gordon Highlanders represents the oldest officially sanctioned regimental alliance in the Commonwealth and small unit exchanges are conducted frequently. A memorial was erected in Mount Pleasant Cemetery, Toronto sometime after 1912 in honour of two soldiers killed returning from a training exercise in 1912 and as a monument to the 48th Highlanders of Canada's veterans and war dead of the South African War. The regiment is nicknamed "The Glamour Boys" or "The Four Dozen". The name "The Glamour Boys" was coined by the other regiments that served with the 48th Highlanders during World War II in the 1st Canadian Infantry Division, 1 Brigade. The brigade was being inspected by King George VI but there were not enough regulation khaki puttees (leg wrappings) for all the soldiers. The 48th had to wear unofficial blue puttees. The King inquired as to why the 48th wore different puttees from the rest of the brigade. He was told that there were not enough khaki ones for all the units. The King replied that he liked the blue puttees better and that they should keep them. The 48th Highlanders continued to wear blue puttees until battledress was eventually phased out. The nickname "Four Dozen" is a play on The Dirty Dozen and "48" being equivalent to four dozen. The regiment provided a Guard of Honour for the G7 summit in 1988, a full Royal Honour Guard for Queen Elizabeth II in 1998 as well as the Royal Winter Fair, annually. The Regimental Colour Party has marched in events as far afield as Prince Edward Island and the United States, and remains in great demand as a living example of the pageantry and gallantry of the Highland regimental tradition. The regiment's Military Band and the Pipes and Drums have played at every Toronto Maple Leafs home opening game at both Maple Leaf Gardens and the Air Canada Centre. The bands were requested by Conn Smythe, who had been a major in the First World War, to play at the opening of the new Maple Leaf Gardens on November 12, 1931. 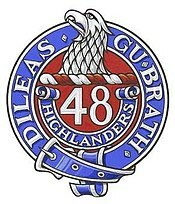 The regiment's motto is Dileas gu brath, which is Gaelic for "faithful forever". The regimental tartan is the Davidson, but pipers wear the Stewart of Fingask. The regiment's Colonel-in-Chief is Elizabeth II. The regiment supports two cadet corps. These are the 48th Highlanders Royal Canadian Army Cadet Corps, which is based in the same armoury as the regiment itself, and 142 St. Andrew's College Highland Cadet Corps, based in Aurora as one of the mandatory activities for students of St. Andrew's College. The 48 Highlanders contributed individual volunteers for the Canadian Contingents to South Africa, mainly the 2nd (Special Service) Battalion, Royal Canadian Regiment of Infantry. During the Great War, the 15th Battalion, CEF, was authorized on 1 September 1914 and embarked for Britain on 26 September 1914 and arrived in France on 15 February 1915. The battalion fought as part of the 3rd Infantry Brigade, 1st Canadian Division in France and Flanders throughout the war. The 15th Battalion was disbanded on 30 August 1920. The 92nd Battalion (48th Highlanders), CEF was authorized on 30 July 1915 and embarked for Britain on 20 May 1916, where the battalion provided reinforcements to the Canadian Corps in the field until 24 January 1917, when its personnel were absorbed by the 5th Reserve Battalion, CEF before being disbanded on 1 September 1917. The 134th Battalion was authorized on 22 December 1915 and embarked for Britain on 8 August 1916, where it provided reinforcements to the Canadian Corps in the field until 7 March 1918, when its personnel were absorbed by the 12th Reserve Battalion, CEF. The battalion was then disbanded on 29 November 1918. During the Second World War, the regiment mobilized the 48th Highlanders of Canada, CASF, on 1 September 1939. It was subsequently redesignated the 1st Battalion, 48th Highlanders of Canada, CASF, on 7 November 1940. It departed Canada for Britain on 16 December 1939, and on 13 June 1940 it went to France as part of the abortive Second British Expeditionary Force. The battalion reached Sablé-sur-Sarthe before being ordered back to Britain. It landed in Sicily on 10 July 1943 and in Italy on 3 September 1943 as part of the 1st Infantry Brigade, 1st Canadian Infantry Division. In March 1945, the regiment moved with the remainder of the I Canadian Corps to North West Europe, where it fought until the end of the war. The overseas battalion was disbanded on 31 December 1945. On 1 June 1945, a second battalion of the regiment was mobilized for service in the Pacific theatre of operations, designated as the 3rd Canadian Infantry Battalion (48th Highlanders of Canada), CASF. This battalion was disbanded on 1 November 1945. The 48th Highlanders of Canada perpetuate the 15th Battalion (48th Highlanders of Canada), CEF, the 92nd Battalion (48th Highlanders), CEF, and the 134th Battalion (48th Highlanders), CEF. The 48th Highlanders Museum is located in downtown Toronto in the basement of St. Andrew's Church at the corner of King and Simcoe. The mission of the Museum is to collect, preserve, research and photograph material relating to the history of the 48th Highlanders of Canada, its former members and its site, and, through the appropriate display of such items, to convey this history to the currently serving members, the broader Canadian Forces community and the public. The museum includes regimental uniforms, medals, photographs, weapons and other artifacts. Founded in 1959, the museum opened in its current location in 1997. The Museum is affiliated with: CMA, CHIN, OMMC and Virtual Museum of Canada. The regimental colour of the 48th Highlanders of Canada. ^ "48th Highlanders of Canada memorial". National Defence Canada. 2008-04-16. Archived from the original on 2014-05-23. Retrieved 22 May 2014. ^ a b Canadian Forces Publication A-DH-267-003 Insignia and Lineages of the Canadian Forces. Volume 3: Combat Arms Regiments. Wikimedia Commons has media related to 48th Highlanders of Canada.